Today is the feast of St. Marie-Eugénie de Jésus, a religious sister who founded the Congregation of the Religious of the Assumption in 1839. On June 3, 2007, she was canonized in Vatican City by Pope Benedict XVI. According to the 1962 Missal of St. John XXIII the Extraordinary Form of the Roman Rite, today is the feast of the Forty Holy Martyrs of Sebaste, a group of forty soldiers who suffered a martyr's death for their steadfast faith in Christ, by freezing in a lake near Sebaste, in the former Lesser Armenia (now Sivas in central-eastern Turkey). The Forty Martyrs were soldiers quartered at Sebaste in Armenia, about the year 320. When their legion was ordered to offer sacrifice to idols, they refused to betray the faith of their baptism, and replied to all persuasive efforts, “We are Christians!” When neither cajolings or threats could change them, after several days of imprisonment they were chained together and taken to the site of execution. It was a cruel winter, and they were condemned to lie without clothing on the icy surface of a pond in the open air until they froze to death. There were warm baths close by, ready for any among them who would deny Christ. One of the confessors lost heart, renounced his faith, and went to cast himself into the basin of warm water prepared for that intention. But the sudden change in temperature suffocated him and he expired, losing at once both temporal and eternal life. The still living martyrs were fortified in their resolution, beholding this scene. Then the ice was suddenly flooded with a bright light; one of the soldiers guarding the men, nearly blinded by the light, raised his eyes and saw Angels descend with forty crowns which they held in the air over the martyrs’ heads; but the fortieth one remained without a destination. The sentry was inspired to confess Christ, saying: “That crown will be for me!” Abandoning his coat and clothing, he went to replace the unfortunate apostate on the ice, crying out: “I am a Christian!” And the number of forty was again complete. They remained steadfast while their limbs grew stiff and frozen, and died one by one. Among the forty there was a young soldier named Meliton who held out longest against the cold, and when the officers came to cart away the dead bodies they found him still breathing. They were moved with pity, and wanted to leave him alive, hoping he would still change his mind. But his mother stood by, and this valiant woman could not bear to see her son separated from the band of martyrs. She exhorted him to persevere, and lifted his frozen body into the cart. He was just able to make a sign of recognition, and was borne away, to be thrown into the flames with the dead bodies of his brethren. Their bones were cast into the river, but they floated and were gathered up by the faithful. Excerpted from Little Pictorial Lives of the Saints, a compilation based on Butler’s Lives of the Saints and other sources by John Gilmary Shea (Benziger Brothers: New York, 1894); Vie des Saints pour tous les jours de l’année, by Abbé L. Jaud (Mame: Tours, 1950). 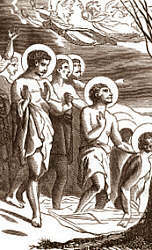 Learn more about the Forty Holy Martyrs here. Read St. Basil's Homily on their festival. March 10 is nine days before the Solemnity of St. Joseph, and the day to begin a novena to St. Joseph for his feast day. Anne Marie Eugenie was born in 1817 in Metz after Napoleon's complete defeat and the restoration of the Monarchy. She belonged to a non-believing and financially comfortable family and it seemed unlikely that she would trace a new spiritual path across the Church of France. Her father, follower of Voltaire and a liberal, was making his fortune in the banking world and in politics. Eugenie's mother provided the sensitive Eugenie with an education, which strengthened her character and gave her a strong sense of duty. Family life developed her intellectual curiosity and a romantic spirit, an interest in social questions and a broad world view. Like her contemporary, George Sand, Anne Eugenie went to Mass on feast days and received the Sacraments of initiation, as was the custom but without any real commitment. However, her First Communion was a great mystical experience that foretold the secret of her future. She did not grasp its prophetic meaning until much later when she recognized it as her path towards total belonging to Jesus Christ and the Church. Her youth was happy but not without suffering. She was affected when still a child by the death of an elder brother and a baby sister. Her health was delicate and a fall from a horse left serious consequences. Eugenie was mature for her age and learnt how to hide her feelings and to face up to events. Later, after a prosperous period for her father, she experienced the failure of his banks, the misunderstanding and eventual separation of her parents and the loss of all security. She had to leave her family home and go to Paris while Louis, closest to her in age and faithful companion went to live with their father. Eugenie went to Paris with the mother she adored, only to see her die from cholera after a few hours of illness, leaving her alone at the age of fifteen in a society that was worldly and superficial. Searching in anguish and almost desperate for the truth, she arrived at her conversion thirsty for the Absolute and open to the Transcendent. When she was nineteen, Anne Eugenie attended the Lenten Conferences at Notre Dame in Paris, preached by the young Abbe Lacordaire, already well-known for his talent as orator. Lacordaire was a former disciple of Lamennais ­- haunted by the vision of a renewed Church with a special place in the world. He understood his time and wanted to change it. He understood young people, their questions and their desires, their idealism and their ignorance of both Christ and the Church. His words touched Eugenie's heart, answered her many questions, and aroused her generosity. Eugenie envisaged Christ as the universal liberator and his kingdom on earth established as a peaceful and just society. I was truly converted, she wrote, and I was seized by a longing to devote all my strength or rather all my weakness to the Church which, from that moment, I saw as alone holding the key to the knowledge and achievement of all that is good. Just at this time, another preacher, also a former disciple of Lamennais, appeared on the scene. In the confessional, Father Combalot recognized that he had encountered a chosen soul who was designated to be the foundress of the Congregation he had dreamt of for a long time. He persuaded Eugenie to undertake his work by insisting that this Congregation was willed by God who had chosen her to establish it. He convinced her that only by education could she evangelize minds, make families truly Christian and thus transform the society of her time. Anne Eugenie accepted the project as God's will for her and allowed herself to be guided by the Abbe Combalot. At twenty-two, Marie Eugenie became foundress of the Religious of the Assumption, dedicated to consecrate their whole life and strength to extending the Kingdom of Christ in themselves and in the world. In 1839, Mademoiselle Eugenie Milleret, with two other young women, began a life of prayer and study in a flat at rue Ferou near the church of St. Sulpice in Paris. In 1841, under the patronage of Madame de Chateaubriand, Lacordaire, Montalembert and their friends, the sisters opened their first school. In a relatively short time there were sixteen sisters of four nationalities in the community. Marie Eugenie and the first sisters wanted to link the ancient and the new - to unite the past treasures of the Church's spirituality and wisdom with a type of religious life and education able to satisfy the demands of modern minds. It was a matter of respecting the values of the period and at the same time, making the Gospel values penetrate the rising culture of a new industrial and scientific era. The spirituality of the Congregation, centered on Christ and the Incarnation, was both deeply contemplative and dedicated to apostolic action. It was a life given to the search for God and the love and service of others. Marie Eugenie's long life covered almost the whole of the 19th century. She loved her times passionately and took an active part in their history. Progressively, she channeled all her energy and gifts in tending and extending the Congregation, which became her life work. God gave her sisters and many friends. One of the first sisters was Irish, a mystic and her intimate friend whom she called at the end of her life, "half of myself." Kate O'Neill, called Mother Therese Emmanuel in religion, is considered as a co-foundress. Father Emmanuel d'Alzon, became Marie Eugenie's spiritual director soon after the foundation, was a father, brother or friend according to the seasons. In 1845, he founded the Augustinians of the Assumption and the two founders helped each other in a multitude of ways over a period of forty years. Both had a gift for friendship and they inspired many lay people to work with them and the Church. Together, as they followed Christ and labored with him, the religious and laity traced the path of the Assumption and took their place in the great cloud of witnesses. In the last years of her life, Mother Marie Eugenie experienced a progressive physical weakening, which she lived in silence and humility - a life totally centered on Christ. She received the Eucharist for the last time on March 9, 1898 and on the 10th, she gently passed over to the Lord. She was beatified by Pope Paul VI on February 9, 1975 and canonized by Pope Benedict XVI on June 3, 2007 in Rome. Born in 1579 at Drum, Keith, Scotland. Walter Ogilvie was a Scottish noble who raised his son John in the state religion of Scotland, Calvinism. John converted to Catholicism at the age of 17 in Louvain, Belgium. Blessed John joined the Jesuits soon after in 1597, and was ordained in Paris in 1610. He was sent to work in Rouen, France. He repeatedly requested assignment to Scotland where wholesale massacres of Catholics had taken place, but by this point the hunters were searching more for priests than for those who attended Mass. The Jesuits were determined to minister to the oppressed Catholic laity. When captured, they were tortured for information, then hanged, drawn, and quartered. Ogilvie's request was granted, and he returned to Scotland in November 1613. He worked as an underground missionary in Edinburgh and Glasgow, dodging the Queen's priest-hunters, disguising himself as a soldier named Watson. After 11 months in the field, John was betrayed, imprisoned, interrogated, then tortured for the names of active Catholics. He suffered in silence. He is the Church's only officially recorded Scottish martyr. He died hanged on March 10, 1615 in Glasgow, Scotland and was canonized by Paul VI on October 17, 1976. Read more about the life of St. John Ogilvie.